Living on Manchester’s West Side during my childhood, we lived fairly frugal, blue-collar lives. For my millworker parents, penny-pinching wasn’t just a fad, it was a necessity. To make matters even more challenging, in the late ’80s, stable piecework jobs faded away and forced our folks, and many others in our neighborhood, to reinvent themselves. Some went back to college, some started their own businesses, some stayed home and raised a family. It was a tough yet exciting time. Throughout it all the comfort foods of our era stayed constant. Cheap ground meats, filling potatoes, golden brown crusts and boiled things — all of these were at the center of our tables. With five mouths to feed, it could have been easy to feel hungry or that we were “doing without.” Looking back, however, nothing could have been further from the truth. Whether it be space, activities or food, my parents were experts at making a lot out of a little. My mother, though, was the queen of stretching a dollar. The number of meals she could pull off with just one roasted chicken was the envy of our tenement. 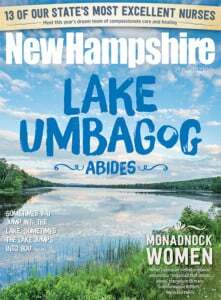 Classic New Hampshire fare was probably never famous for being delicious, sought-after cuisine, but the flavors and sheer act of creation were tied to more than seasoning; there were emotions and memories bound to these foods. Sadly, I’m noticing that this type of low-cost, hearty and nutriment-filled cooking is slowly leaving our dinner tables. The sustenance of my youth, the foods that defined our region and nurtured our souls, is seemingly being replaced by prepared foods sold by the pound. In a time of smartphones, constant connectivity and instant gratification, bringing back classic dishes enjoyed over generations can not only bring families together, but can perhaps also fix a few of the ailments that plague our country at large. Food brings people together, and it always has. Having eaten many different comfort foods in various contrasting cultural settings, I have yet to witness disaffection while sitting together, mouths full, around anyone’s table. Eating a meal together is a spiritual experience that fills more than our stomachs. New Hampshire cuisine is the result of frugality and the melding of cultures. We can see it everywhere if we look in the right places — French Canadians, Irish, Portuguese, Italians, Greeks and more — all settled here to make a living and their culinary influence came with them. In my family, wafts of beef stew, pot roast or my grandmother’s famous pork chop casserole warmed our spirits, especially in the cold winter months. My personal favorites were generally bubbling crocks laden with cheese and butter-cracker-crusts or staples like porcupine meatballs, orbs of beef laden with rice, simmered in a condensed tomato soup “sauce,” and American chop suey, a regional “goulash” overflowing with ground beef, elbow noodles, green peppers, onions and tomato sauce. It’s no wonder I gravitated toward making food for a living. There was tourtière, a hefty pork pie, and poutine, hand-cut French fries sprinkled with squeaky cheese curds, both smothered with unctuous beef gravy. And how could I forget the staple of boiled dinner, corned beef, potatoes, carrots, turnips and pickled beets. My mom’s spin usually included cheap lobs of kielbasa that would end up a cold snack for the next day’s school lunches. I fear that an amazing generation of traditional New England foods — big-flavored, inexpensive and uninhibited — are becoming, like the textiles fabricated at the old mills of Manchester, a distant memory. Baked beans and brown bread or Chinese pie mustn’t go by the wayside. As a chef and aging member of “Generation X,” it is my obligation and duty to carry the torch for those in front of us. It’s time to revisit old favorites or, perhaps, discover some new ones. I’ve recently had a chance to thumb through a few of my great-grandmother’s old handwritten recipes. The list of favorites is lengthy and inspiring. Yes, there were those classics that she was known for; cat-head biscuits, macaroni and cheese casserole, beef stew and pot roast, just to name a few. The ones that caught my eye, however, were her desserts. Unapologetically fattening, riddled with cholesterol and trans fats, but oh so amazing. As children, we would sit around Gram Carrie’s orange Formica kitchen table eating her shiny, hot-from-the-lard buttermilk donuts tossed lovingly in cinnamon sugar. Those long-forgotten moments came rushing back to me as I read through these perfectly kept pieces of paper, index cards or cutouts from the long-lost magazines of her time. This recipe box was a sort of T.A.R.D.I.S. that transported me back to a time where things were simpler and not yet hazed by clouds, texts or cat videos. All these amazing morsels were more than just about the sugar, recipe boxes or frying kettles, they were about bonding, growing up and loving each other. Perhaps our general sense of division in New Hampshire, or anywhere in the country for that matter, could be healed just by taking time on a regular basis to pull down an old cookbook on a rainy day or share a casserole together a few nights a week at the dinner table. The dinner table itself may be among the lost; either turned into a place to stash the piles of mail or sit listlessly staring at our smartwatches. Counting steps may become more important than counting the minutes until dinnertime. These recipes connect us to our past and could heal our present whilst setting us up for a very different future. In New Hampshire, reestablishing the lost act of eating together, especially those cultural classics, every night could start a positive revolution. Grab a cookbook, call your grandmother or visit the library and make some memories together. I have included four savory dishes that were an important part of my family upbringing, as well as one dessert. These meals are the center of some of New Hampshire’s most cherished comfort foods. I hope you enjoy them. Porcupine meatballs are not only great as a nice, hearty dinner, but they make great leftovers. We make club sandwiches with them the next day. In a medium-size bowl, combine meat, rice, egg, parsley, onion, garlic powder, paprika, pepper, salt and ¼ cup tomato soup. Mix thoroughly and shape into about 20 meatballs and place in a skillet. Mix remaining soup, water and Worcestershire sauce. Pour over meatballs. Bring to a boil and reduce heat. Cover and simmer for about 25-30 minutes, stirring often. Rice should be cooked and sticking out of the sides of the meatballs. Similar to American goulash, this regional fare has been a staple throughout the working class and can still be found on menus of area diners. Heat the butter in a large pot over medium heat. Add the onion and bell pepper and cook, stirring occasionally, until soft, about 5 minutes. Add the garlic and cook, stirring, for about 1 minute. Then add the ground beef and continue to cook, stirring and breaking up the chunks of meat with a spoon. Cook until the meat is no longer pink, about 7 minutes. Drain off most of the fat. Sprinkle the herbs and pepper over the meat, add salt to taste and mix in well. Add the canned tomatoes with their juices, the tomato sauce, paste and juice. Add sugar to taste. Simmer while you cook the pasta. Bring a large pot of salted water to a boil over high heat. Add the macaroni and cook, stirring occasionally, until al dente. Drain. Mix the macaroni into the chop suey. Serve hot. This simple gravy can be thrown together in about 10 minutes. Not only was this a staple in our house to pour over pork pie, this gravy is also a great go-to for mashed potatoes or pot roast. In a medium saucepan, bring beef broth to boil over medium-high heat. Stir in garlic powder, onion powder and Worcestershire sauce. In a small bowl, whisk together cold water and cornstarch until dissolved. Pour into boiling beef broth and reduce heat to medium-low. Stir until thickened. Season with salt and pepper. Adjust seasoning according to preference. Add optional heavy cream for creamier gravy. Serve hot over pork pie. This recipe makes about 2 cups of gravy and can easily be doubled or even tripled if you use a large saucepan. Thought to have originated by French Canadian millworkers in the 19th century, this New Hampshire version of tourtière was originally served to help celebrate the New Year. This recipe is my favorite. In a medium saucepan over medium-low heat, combine pork, onion, salt and water. Simmer gently, stirring often, until all liquid evaporates, about an hour. Stir in spices. Add potatoes and mix well to combine thoroughly. Heat oven to 375F. Line a pie plate with one crust. Spoon in pork/potato mixture. Add top crust and flute the edges. Brush the top with milk and slice four, 1-inch slits into the top to allow steam to escape. Bake 30 minutes or until golden brown and internal temperature is at least 145F. Meanwhile, make beef gravy (recipe above). This recipe can be used to fill a very deep pie pan for a holiday centerpiece (pictured) or can make two pies where one can be frozen for later. In my family, we would usually bake one for Christmas and save the second one for Easter, but this dish can be eaten any time of the year. Regarding the crust — the addition of vinegar and egg will make the crust a bit flakier as well as alleviate the chances of getting a tough crust. This dish is called “Chinese Pie” or “Pâté Chinois.” Thought to have been created by Canadian immigrants working on the railroad in China, Maine. There’s no doubt that this is a huge part of our New Hampshire history. It’s even better the next day. Add onion and cook 3-4 minutes, add ground beef, salt and pepper and cook until brown and breaking up any large chunks with a spoon. Place into a casserole dish making a nice layer. Layer the creamed corn on top. Spread the mashed potatoes on top being sure to completely cover the corn layer. Sprinkle a thin dusting of paprika on top of the potatoes. Bake for 35 minutes or until golden brown. The corn layer should bubble slightly around the edges of the potatoes. Serve with a garden salad and buttery rolls. As with many of our states classic foods, this cake was born of a time where eggs and oil were scarce. Cream together mayonnaise and sugar. Alternatively add dry ingredients and water until blended together. Stir in vanilla extract and stir until everything is combined and smooth. Spray a 9-inch round cake pan with non-stick spray. Bake in 350F oven for about 35 minutes or until a toothpick inserted in the middle comes out clean. Cool for 10 minutes in cake pan and carefully remove from cake pan and cool completely on a cake rack. Ice with chocolate buttercream icing. Add the confectioners sugar and cocoa powder to the bowl and beat until combined. With the stand mixer running on low speed, slowly stream in the milk and vanilla extract then add the salt and continue beating until well-combined, scraping down the sides as needed, about 2 minutes. Increase the speed to high and beat the frosting for an additional 2 minutes.